Alright, so after finally seeing this type of design in action at the Korean Robot Game Festival, I've started giving it some serious thought. I have an interesting email discussion forming with some colleagues of mine and I'd like to share that as well as open it up here for some Q&A. 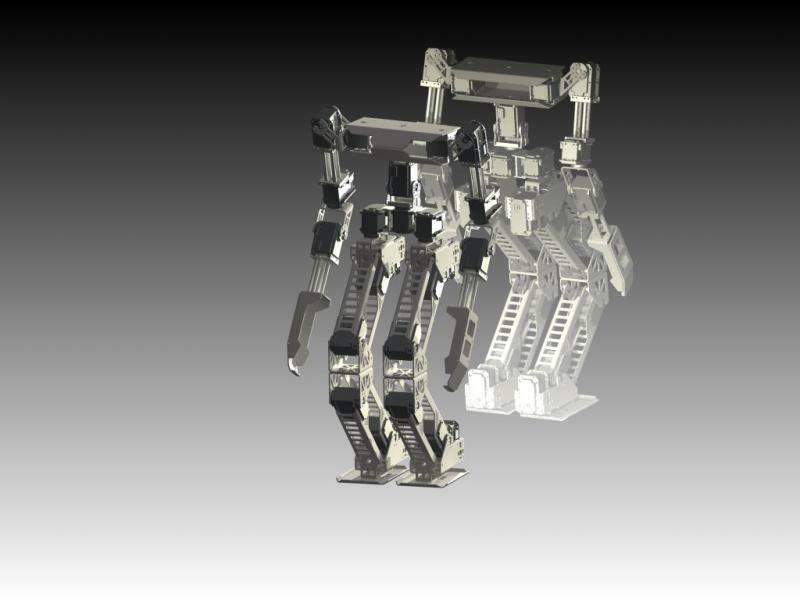 Consider this an open discussion on furthering humanoid leg designs, as I feel this will be beneficial to all humanoid builders and especially those of us building bipeds for Mech Warfare. What is a Parallel Leg Mechanism (PLM)? I'll get to this shortly, first let's lay down some ground for comparison. 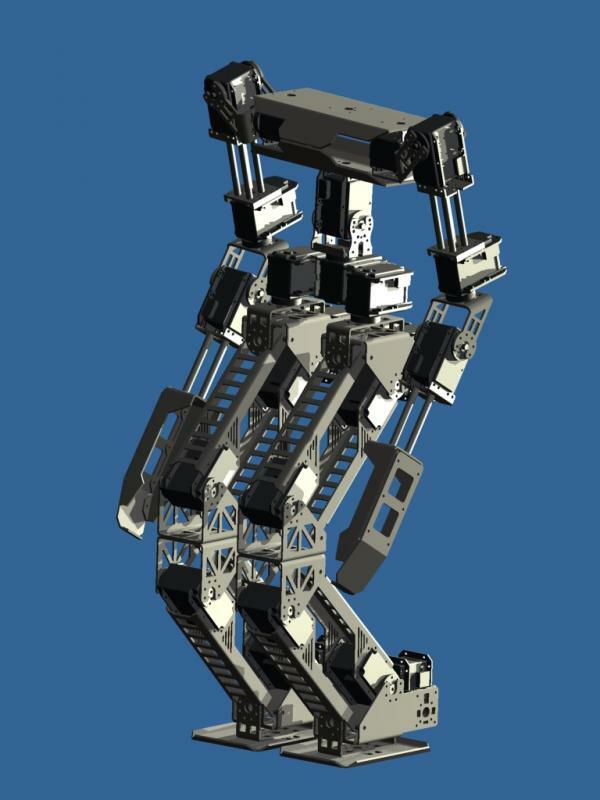 In a standard humanoid leg design, you generally have 3 pitch servos: ankle-pitch, knee pitch, and hip pitch. For the sake of clarity in this discussion, we're going to assume that hip-roll and ankle-roll also exist, giving us a minimum of 5dof (or 6dof if you have hip-yaw, but that's not important for this discussion) for a starting point as a 'standard leg' design. So with that said, let's ignore roll & yaw servos and focus on the pitch servos, as that is what is important here. Each one of these pitch servos gives flexibility to the leg, but the leg is only as strong in terms of lift/push/pull as a single servo joint. Each pitch axis also suffers from gear backlash, also known as 'gear slop'. 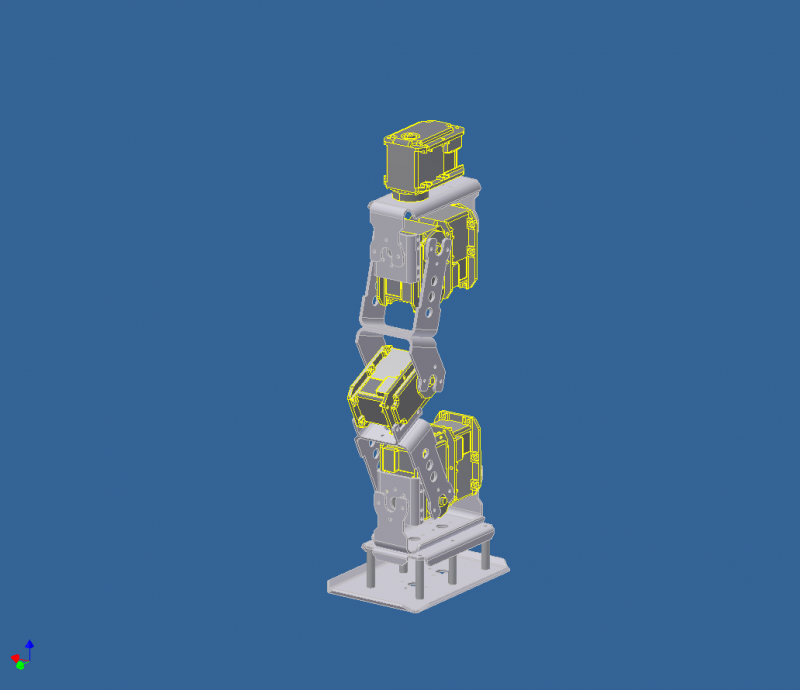 These two problems end up hurting biped leg design a pretty decent amount, as your payload is always pretty limited, and the more weight you put on a robot, the more backlash hurts you. How about ways to prevent this and/or increase torque? You could very well double up each pitch axis by placing the servos back to back. This would effectively double your torque and could be used to eliminate backlash. Problem here is you now have 6 pitch servos and a very wide leg, not to mention the increased weight. The weight then starts to cause a problem for your ankle and hip roll servos. So while that's one option to increase your torque and help eliminate backlash, it's probably not ideal for more compact robots. So as you can see, a PLM design leg uses additional linkages which bind the rotation of the axis points together mechanically. The ankle, knee, and hip all remain parallel to the ground. Ability to utilize 2, 4, 8, 16 pitch servos per leg. Increased torque when servos are added to PLM, without widening leg. 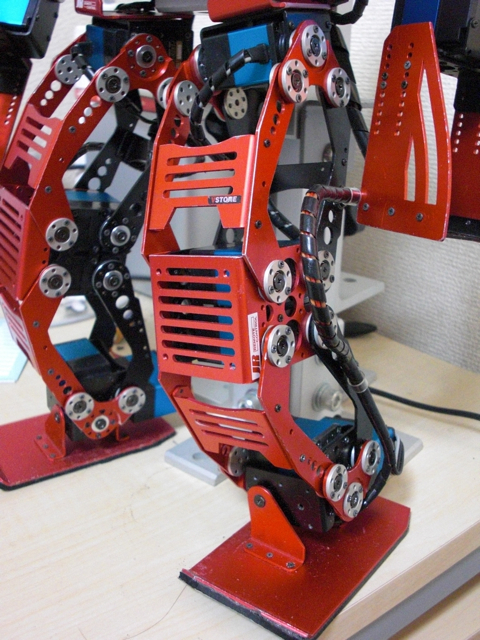 Ability to only use 2 pitch servos instead of 3 while maintaining a functional leg, reduced weight. Standard IK models will not work without additional constraints. Potential to add stress to servos if not properly paired. So what does this mean for you (I'm looking at you Mech Warfare biped pilots)? If you utilize a 2 pitch servo PLM leg design, you've eliminated a 3rd pitch servo and thus lowered your weight while severely reducing your backlash. This means more payload and stability. If you utilize a 4 pitch servo PLM leg design, you've greatly increased the torque on each PLM and have the ability to virtually eliminate all backlash. This means more even more payload and stability. I'll dive into the design implementation a bit later, there are definitely some pitfalls and tricks you need to know to successfully pull it off. 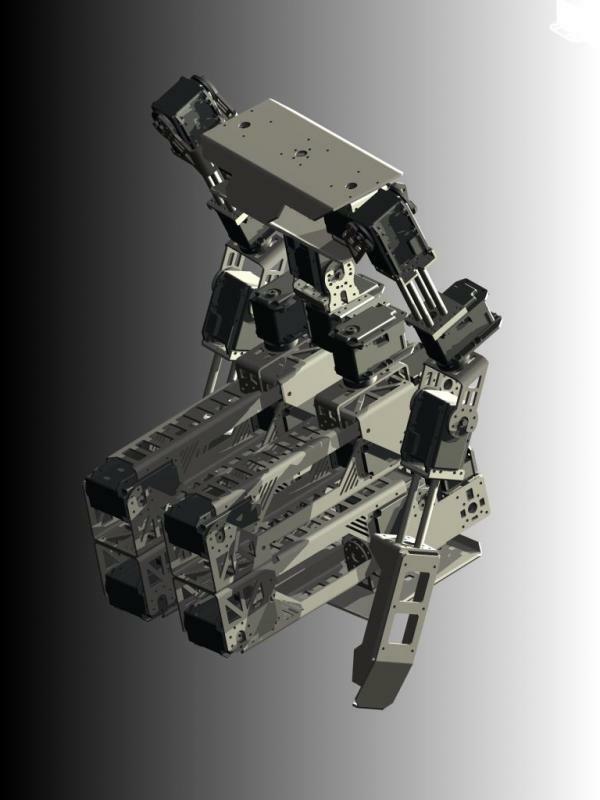 I'm working on upgrading Giger to a 4 servo-pitch PLM design as well as tinkering with a 2 servo-pitch and 4 servo-pitch AX-12 biped for mech warfare, so I'll have plenty to share in the near future. Here's a video that demonstrates the difference between a standard and PLM leg design. The first 20 seconds are using 4 pitch servos in a standard, non PLM, configuration (so double knee servos). 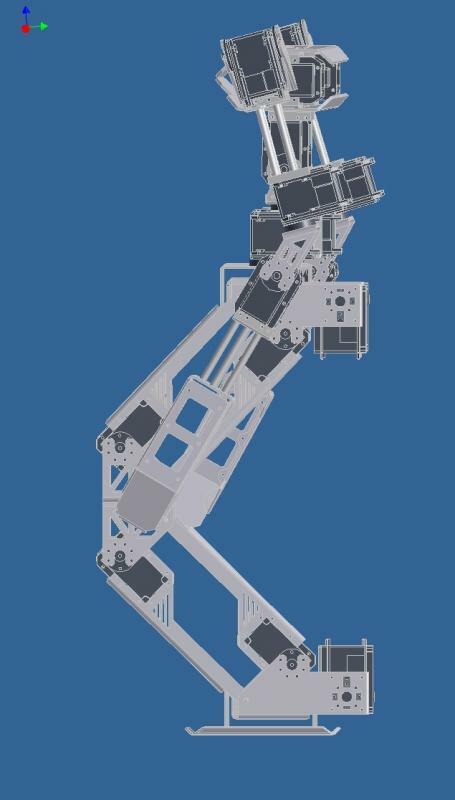 After that, you see the same robot with a redesigned 2 pitch servo PLM configuration. Look at how much smoother and stable it is. This doesn't even demonstrate the increased torque capabilities of 4+ pitch servos on a PLM design. So that's about it for now. Thoughts, questions, comments? I'm going to include the emails of us kind of thinking through all of this (we're all still learning) thus far for those of you interested in reading more of the discussion, but for those of you who've had enough of my yapping, feel free to stop talking here! Tyberius wrote: I have two designs in my head right now. 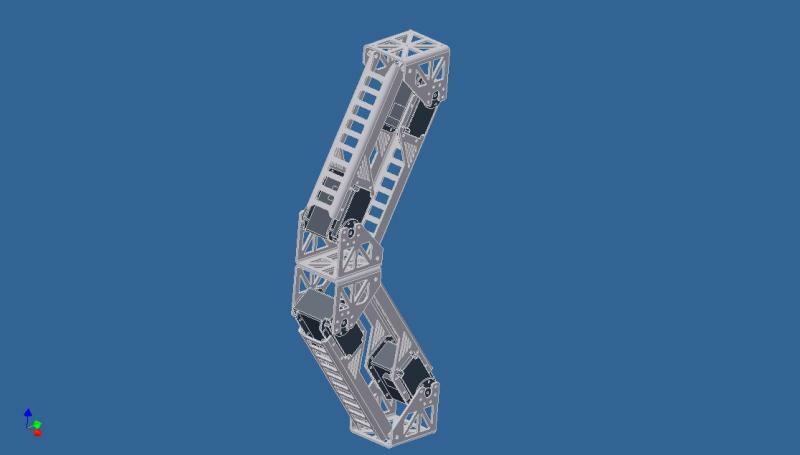 Uses 2 pitch servos per PLM, for 4 total in the leg dedicated towards pitch. servos), you'd just get double speed. Am I correct here? hip, and then two servos in the knees- one for each PLM (upper and lower)..
Billy wrote: The four advantages I see for a PLM design are.. It's just easier to make a stiff frame. Lets you move an ankle servo to the knee. Lets you double up your servos in a convenient and compact way. frame and less required servos. would allow for backlash tweaking though. the point of the extra hip servo. half ) and pushrod ankles and hips. Tyberius wrote: A 4 pitch-servo PLM Leg, if done correctly, should increase torque. It's never going to exactly double it, due to friction and magical fairies, but it's certainly a load distribution method. 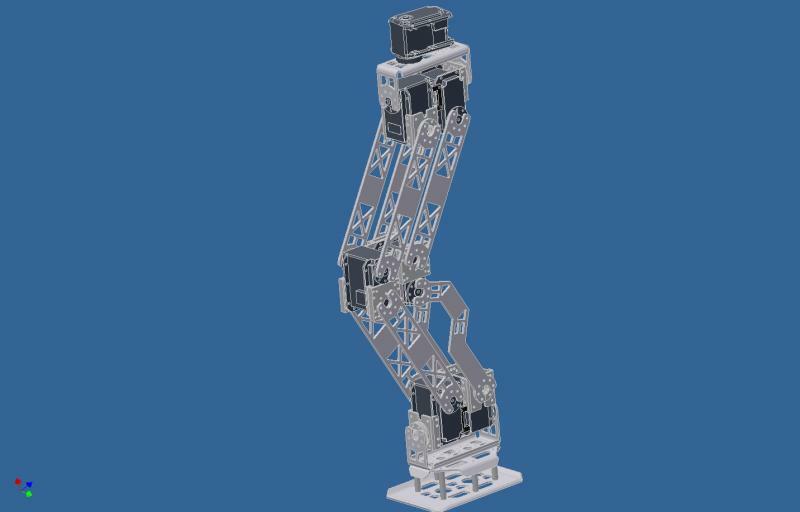 Lets say we have a standard, non parallel leg design with double knee servos, so 4 pitch-servos total but without any mechanical link between them. If two of the servos move in a counter rotation of 30 degrees for X seconds, they'll have covered 60 degrees in X seconds. This can create double speed, but not any additional torque as each pitch axis is only as strong as a single servo. You also still have backlash to contend with. A PLM leg design with 4 servos ties each top and bottom pair of servos together mechanically, so that the servos cannot move in a counter rotation and must move at the same speed. If say, the two top PLM servos are paired via software or the EX-106+ link cable, they effectively move as one servo and the mechanism helps distribute the load between the two. If each servo moves in a synchronous rotation of 30 degrees in X seconds, they'll have covered 30 degrees in X seconds. 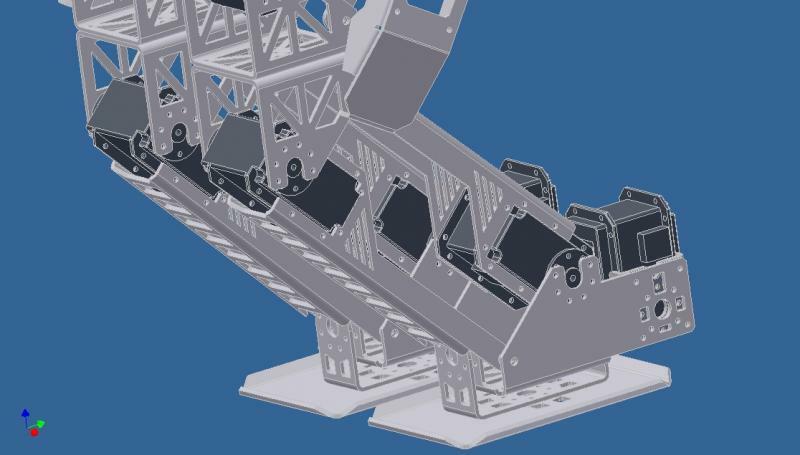 A single PLM assembly (top or bottom half of a leg) would have 8 rotational pivots, all mechanically tied together. At this point, it doesn't really matter which of the pivots are powered, does it? I really like the PLM design, I first saw it in OmniZero.4 and then in IGNIS. Can you explain how the servos in OmniZero.4 are aligned? I can;t actually see anything from the pictures. My second fight opponent was a PLM design. It is huge but still under 2KG due to PML design. 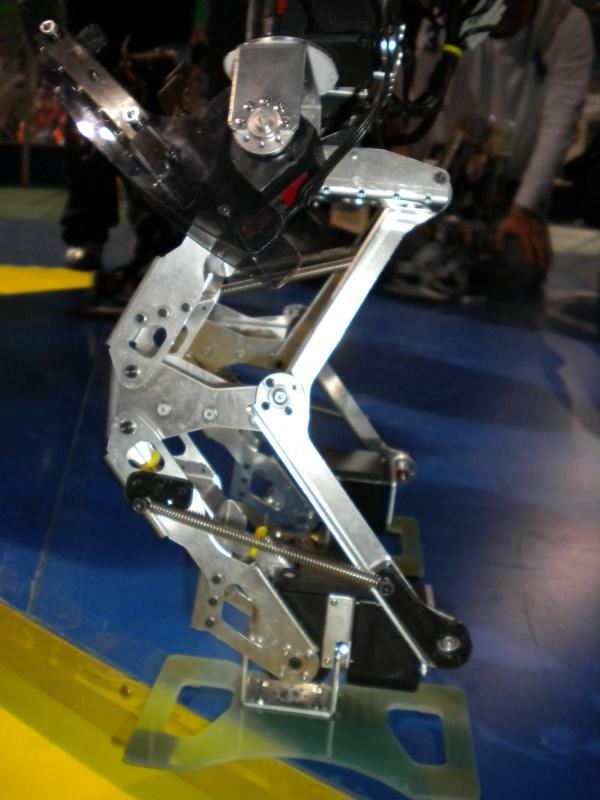 People say it can't Kick but the Japanese robot played football, no ? Main advantage of PLM is that it can increase stabiity and reduce cost of 2 servos and reduce weight. Right now I am playing around with other dirty method to stiffen up the angle servos with rubber band and wrist band. Yes, looks like it kicked quite good in the video. This robot is using this design too. I wonder if you can do this with a Bioloid Premium too. what cad app can i use to do this ? Robita-kun used Alibre design for designing ignis. I'd recommend using Autodesk Inventor. It's easier. you can easily do such a thing using Dassault CATIA v5. Unbelievable how good this thing looks. Tyberius I love your Giger design. About how tall is it? In it's current proposed form it would be about 80cm when standing fully upright. This is including the torso redesign that I have in the works. That running bot and IGNIS are both really impressive. Not sure if this is a given or if someones suggested it already but couldn't you configure the parallel servos to use the same signal wire? Nice thing about the EX-106+ is that they actually have a separate link cable feature that does exactly that. You can pair the servos together using it and then just send commands to the 'master' servo.